After a two-month hiatus, I’ve finally completed the next installment in my increasingly non-linear series of posts examining the (mostly bad) arguments against the reality of global warming. Originally I had planned out a sort of arc of subjects to cover, but as I learn more about climate science, I find I want to go back to what I’ve written previously and add new information, or explain things in a different way — that’s why I’m calling this post Part 1.1. So here’s a continued version of my argument in favor of the surface temperature record. I discuss one of the latest trends in the climate blogosphere: amateur temperature records. Claim: The surface temperature record cannot be trusted. Fact: Recent developments should make us even more confident that the record can indeed be trusted. As I’ve mentioned before, there are three main surface temperature records, compiled by NOAA’s National Climatic Data Center (NCDC), NASA’s Goddard Institute for Space Studies (GISS), and the University of East Anglia’s Climatic Research Unit (CRU), respectively. There is also at least one other that is lesser known: that of the Japan Meteorological Agency (JMA). All of these analyses have been compiled by professional research organizations and published in peer-reviewed scientific journals. All of them converge on a common result: the Earth’s surface has warmed about 0.7°C in the last 100 years, and about 0.18°C/decade in the last 25 years. 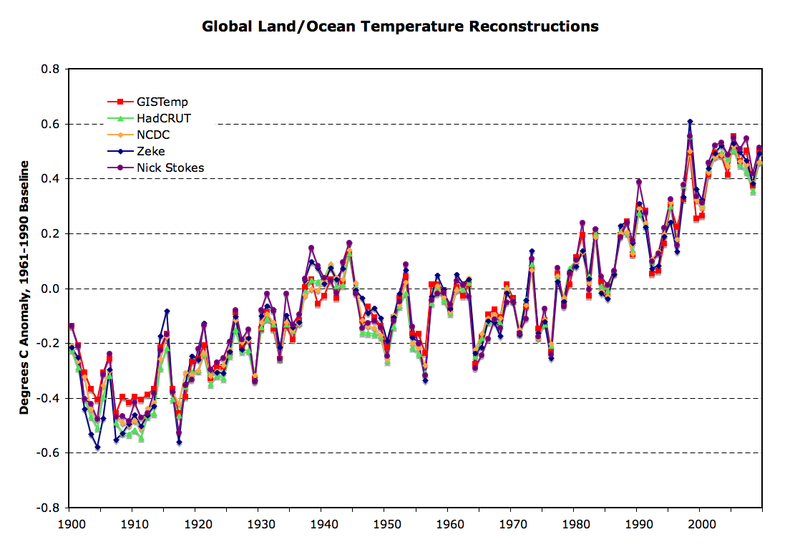 So all the records taken together can be seen as a sort of “consensus temperature record”, in which the observed warming is well outside the error bars. Unfortunately, some members of the public are inclined to believe that this convergence is all part of a huge conspiracy, that scientists are not allowed to get results that contradict the pre-determined conclusions of the so-called “establishment”. This view is entirely at odds with my understanding of how science works, but it’s a depressingly common one. It’s also a difficult view to argue with, because the more positive results you cite, the bigger the conspiracy must be in the eyes of the conspiracy theorists. But what if there was a global temperature analysis entirely independent of the scientific establishment? You might be surprised to learn this is now the case, thanks to one of the latest trends in the climate blogosphere. In the wake of the “Climategate” scandal (you’ve probably heard of it — a bunch of private emails between CRU scientists turned up on the internet, and contrarians mined them for suggestive quotes), professional climatologists have redoubled their efforts to make climate science more open and transparent, including making raw data publically available. The land data comes mostly from the Global Historical Climatology Network (GHCN) of weather stations, although GISS use additional US and Antarctic data. This is combined with sea surface temperature (SST) data from the UK Met Office’s Hadley Centre (or NOAA’s own SST records in the case of NCDC) to create a global temperature record. The main source of controversy is that CRU also uses private land data, some of which they do not have permission from the original owners to make available. In recent years, this has led to a torrent of FoI requests, and the aforementioned email hacking. However, according to the University of East Anglia, over 95% of their data is available from GHCN; and they have also recently released some more data which they’ve now gained permission to make public. Anyway, now the data is becoming more and more accessible, amateur climate bloggers have been using the same data to construct their own temperature records. When I first learned of these endeavours, I was of two minds. On the one hand, I thought these amateurs might be able to make a useful contribution by discovering any major errors or biases in the record. On the other hand, I was apprehensive that if they bungled the whole thing, they might prematurely jump to the conclusion they had discovered further evidence of the aforementioned conspiracy. But on the whole, I considered, a bit of outside scrutiny could only be good for science (though in the short-term, it’s a potential public relations disaster). If the amateurs did get significantly different results, that wouldn’t mean we should immediately abandon the professional records; I’d still consider it more likely the professionals got it right because they knew what they were doing. But it would mean that climate scientists would have to go back and check the original results, examine the differences in methodology, to figure out who went wrong and where. And it was always possible that this process might end with a consensus temperature record very different to the one we have now. If the amateurs got the same or very similar results, that would be a strong confirmation of the original results. Most of these people are self-identified climate “skeptics”, “agnostics”, or “auditors”, who would probably like nothing better than to prove the scientific establishment wrong (especially if they can do it with the scientists’ own data!). They are the last people who are likely to fall victim to any “groupthink” within the climate science “establishment”. I don’t pretend to understand all the intricacies of reconstructing temperature records (which involves anomaly calculation, spatial weighting, interpolation, etc). You can find plenty of discussion about that on other climate blogs; but it’s not what this post is about. I’m more interested in the results. And I have to say the results have been interesting. 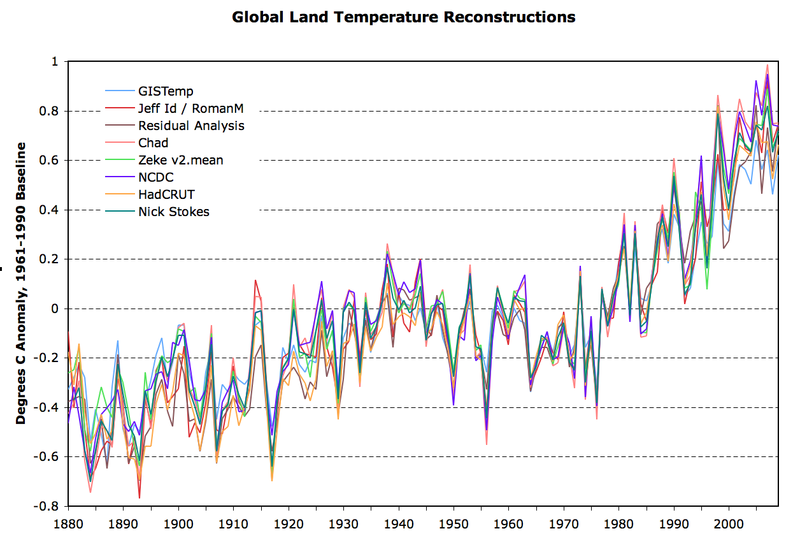 A comparison of global land temperatures in professional and amateur analyses. All of them got similar results to the big three and to each other. The CCC reconstruction is not shown above because it is virtually identical to GISS. Although GISS temperatures appear to be lower than in the other analyses, this turns out to be an artifact of a difference in the way data are weighted according to latitude zone. It’s ironic that, despite all the noise contrarians make about GISS being untrustworthy because its director is “alarmist”, it actually underestimates the warming over land. Following on from these successes, Stokes and Hausfather each proceeded to create global reconstructions combining land and ocean data. As with the land reconstructions above, both track the professional records very closely. In fact, they find slightly greater trends in the last 50 years than any of the “big three” (to be precise, 0.150°C/decade in Stokes’ analysis and 0.139°C/decade in Hausfather’s, compared to 0.135, 0.135, and 0.134 in GISS, CRU, and NCDC). A comparison of global temperatures in professional and amateur analyses. GISS shows higher temperatures in the last five years than NCDC or CRU. The reason for this discrepancy is widely known: whereas CRU implicitly assumes that temperature anomalies in areas with no station coverage are equal to the global average, the GISS method interpolates values based on data from the closest available stations (I haven’t been able to find much info about interpolation in NCDC). Because temperatures are increasing fastest in the Arctic, where there are few stations, this interpolation results in a higher global temperature. It seems that the choice of land temp series, SST temp series, adjustments (raw vs adjusted GHCN, USHCN, urbanization corrections via nightlights, etc), anomaly method, and gridding method does not make an immense difference; regardless of the way you put it together, the data will produce a global surface temperature anomaly similar to the ones in the graphs above. So these amateur efforts only strengthen the “consensus temperature record” I referred to above. The contrarians have no case against it. Update 29 July 2010: A comprehensive overview of this topic can be found at Skeptical Science, explaining among other things how we know global warming is not an artifact of GHCN adjustments, declining numbers of stations, stations located at airports, or even raw GHCN data. I intend to post some further thoughts on this soon. Note that the Muir Russell inquiry team did a reconstruction as part of their inquiry. The report, published this week, says that it required “a few hundred lines” of C++ and took a couple of days. Of course, it reproduced the well-known curve. See chapter 6 and appendix 7 of the inquiry report. Just to note that ccc-gistemp, being a faithful reconstruction of NASA GISTEMP, already had a combined land–ocean analysis. See the 2009 result for example. In fact in CCC’s case, the land-only index came after the combined land–ocean analysis.